I had just turned 16. It was my first concert at Massey Hall. I traveled in from out of town and met up with some friends I had spent the previous summer touring Ontario in a group called Summersounds 71. We were all musicians together. Blue had come out that summer and in the world pre Walkman/iPod I had only one day to listen to the album on vinyl before leaving for the whole summer. I memorized it and played it in my head all summer. The concert on that cold night was a dream. Jackson Browne was a thrilling discovery. 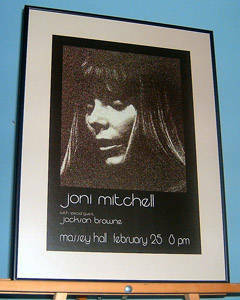 Joni was/is one of the most spectacular performers I will ever hear, if not the most. I was 22 and in love with Joni Mitchell's voice. At the time I was living with my ex-husband in Nova Scotia, two hippies finding their way in that rural and chilly gorgeousness, young refugees from privileged lives in the lower 48. I think we drove all the way to Toronto just to see Jackson Browne and Mitchell's concert. We may have slept in our old Volvo that night, can't recall. I do know that the moment she walked onstage, I was transfixed. 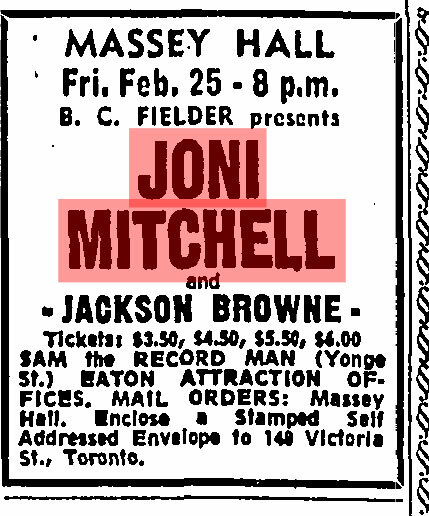 It remains one of the two times I ever saw her perform, the other in Toronto as well, with Dylan's Rolling Thunder Review. As a poet and lyricist, her songwriting has always grabbed at my heart. As a musician, she's incomparable. I even taught from her songbook to my sole student studying piano, back in rural Nova Scotia. I remember this concert very well. My friend and I took a bus from our home, Niagara Falls, NY to Toronto to attend. We arrived in Toronto several hours before the concert began and since we were teenagers, had no money to go to dinner at a restaurant. It was freezing cold outside and we had nowhere to go. We decided to go hang out by the stage door in case we could get a glimpse of Joni arriving (we didnt). However, while we were waiting, this very good looking young guy got out of a taxi and approached us. Being gay, we were both totally ok with that. We talked to this guy and he was extremely nice. He let us come in the hall to get out of the cold and he talked to us for a good amount of time. He said some great things about Joni and we assumed he was one of her roadies. Before he left, I asked if he was Joni's manager and he laughed and said no. When the concert began, they introduced Jackson Browne who wasnt known at that time, at least by this crowd. Well, this was the guy who spent time with us and he really made a great impression on the audience. My friend and I thought he was great and became a fan too. He never mentioned that he was a singer/songwriter. I remember Joni having a cold and was a little hoarse but she sounded fine.